Everyone dreams of having a superpower. Me? I’d love to be able to fly so I could avoid rush hour traffice or be able to remember each book I’ve ever read in its entirety. Everyone has also felt like a freak at one point or another in their lives: not fitting in, not being accepted, not part of the norm. There are people, however, that we would classify as real freaks, not able to intermingle with society, keeping to themselves. You’ve seen these people: they fade into the shadows, they keep to the sidelines, they are quiet and speak rarely. Everyone has been a freak at one time or another. That is what makes FREAKS! written by Caroline Smailes, Nik Perring and illustrated by Darren Craske so amazing. They have created a book that is for each and every person who has never felt as if they fit in anywhere. FREAKS! is a collection of 50 short stories, some written by Caroline, some written by Nik, some written together. The stories are illustrated by wonderful drawings by Darren that bring the story to life in a way that transcends the short story genre. Part collection, part comic book, part darkness, part hilarity, FREAKS! is a book that goes beyond the short story genre and makes it something all the more incredible. I knew from the moment that I looked at the cover of FREAKS! that I was in for a treat of monumental proportions. Eschewing the traditional short story, the ones contained in this collection are flash fiction pieces, stories told in comic book form, stories told in mere paragrahps that pack whole pages worth of emotion into very few words. I read FREAKS! in less than a day. I simply could not put it down. All the stories feature people with superpowers, real or imagined, and give us a brief look into their lives. Some of the stories are funny and downright hilarious, some end with a punch to the gut, some take a twist in the middle and leave you shocked. Others are haunting, harrowing and dark. However, all the stories in FREAKS! are beautiful. I had a very personal reaction to this collection. I have always felt like a freak, as if I don’t belong, as if I was put on this earth to do something but had no idea what it was. I’ve always felt as if I was outside the norm and have never been sure if the norm was something I wanted to be a part of anyways. In reading FREAKS! I felt as if I was reading about people I knew. I even recognized myself in a few of the stories. The stories, the characters, feel so personal, as if we are being presented with a moment in the time of their lives. I ached for this book of freaks and wanted them to know it was okay to be who they were. Though short, the stories are written so well and so deftly that no further words are needed. Caroline Smailes and Nik Perring have outdone themselves with their stories; each can be read in a few minutes, but all of them will stay with you long after you finish reading the collection. The illustrations are another amazing thing about this collection. Darren Craske has outdone himself, bringing the freaks to life in fantastic black and white illustrations that help the characters to jump off the page. The illustrations are so good that I felt I was reading a pulp comic book from days gone by. The stories are amazing and the illustrations just add to the over all perfection of the book. I finished reading the paperback book yesterday morning and am reading the eBook now. While I love eBooks and primarily read everything on my iPad, FREAKS! is a book that you will want to hold, a book where you will want to thumb through the pages. Though I love eBooks, do yourself a favour and get the paperback. It’s well worth double the price you’ll pay for it as the stories will stay with you forever. 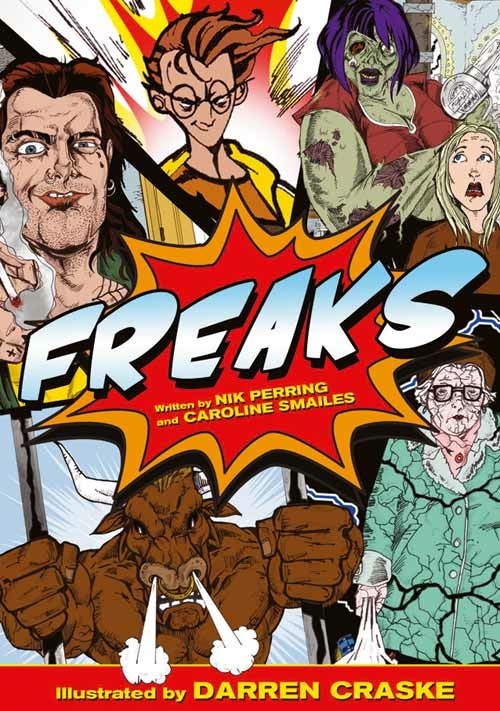 Whimsical, haunting, hilarious and harrowing, FREAKS! is like nothing you have ever read or will read afterwards. FREAKS! has turned the genre of the short story into a revolution. The literary world will never be the same again.